America’s drug-pricing scandals all follow the same script. First, the media notice that a certain pharmaceutical giant has hiked the price of a lifesaving drug by several hundred percent. The company’s chief executive receives a public flogging, and offers a few concessions. Members of Congress hold hearings and express outrage, but never get around to voting on proposals to bring down prices. Americans go on paying more than anyone else in the world for their prescription drugs. 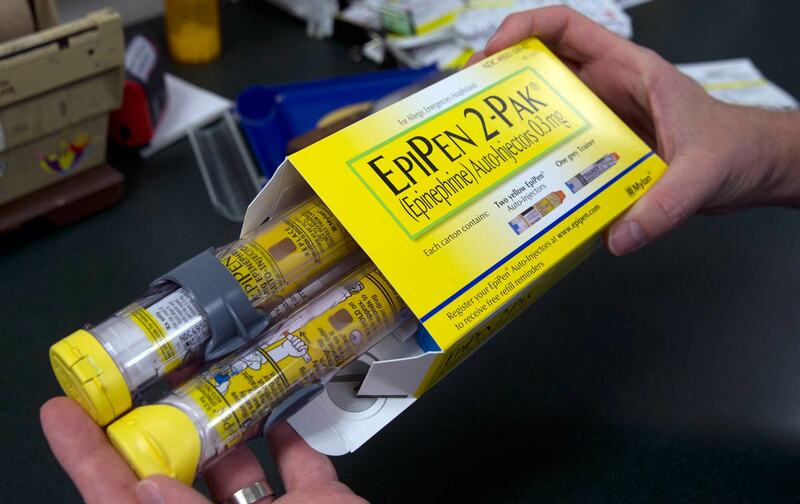 The pattern is playing out again with Mylan, the manufacturer of the EpiPen, a device that injects epinephrine to counter extreme allergic reactions. Epinephrine itself is cheap; the injector delivers less than $1 of the medicine. But Mylan has a near-monopoly on its design, thanks to deft manipulation of patent law, aggressive lobbying, and widespread marketing. That’s allowed the company to steadily raise the price of the EpiPen, from $58 for a single pen in 2007 to upwards of $600 for a pack of two. Mylan now collects more than $1 billion a year from EpiPen sales—a windfall made possible by US patent law and American taxpayers (the Department of Defense sponsored the development of the EpiPen’s precursor in the 1970s), but shielded from US taxes because of the Pennsylvania-based company reincorporated itself in the Netherlands in 2014. The Senate’s Permanent Subcommittee on Investigations announced a “preliminary inquiry” into the price hikes on Wednesday, and New York Attorney General Eric Schneiderman has opened an antitrust investigation into potential anti-competitive language in Mylan’s contracts with school districts in the EpiPen4Schools program. Despite all of this attention, Big Pharma’s latest gaffe is being papered over with some familiar myths about why prices are skyrocketing. Here are five. First it was Giliad Sciences, which put a $1,000 per-pill price tag on its hepatitis C drug Sovaldi. Then it was Valeant Pharmaceuticals, which ratcheted up the prices of two crucial heart medications by 525 percent and 212 percent. Next came Teurig Pharmaceuticals and its then-CEO, Martin Shkreli, who smirked and rolled his eyes when members of Congress questioned why his company had raised the price of the AIDs drug Daraprim from $13.50 to $750 a tablet . Mylan joins this string of “outliers,” as Brent Saunders, the CEO of Botox maker Allergan, called price gougers on Tuesday. But more than a few bad actors are responsible for the fact that prescription drugs cost more in the United States than anywhere else. Prices are rising across the board, even for basic medicines like insulin. The hormone has been used to treat diabetes since the 1920s, but between 2002 and 2013 its price jumped by more than 200 percent. Another example is Naloxone, used to reverse opioid overdoses, which costs as much as 17 times what it did just two years ago. In other words, Mylan is not an outlier but a footnote in an industry-wide pricing swindle. To be fair to Big Pharma, the industry is taking advantage of a system ripe for abuse. “This is what economic theory predicts: When you give people monopolies, they will exploit them,” says economist Dean Baker of the Center for Economic and Policy Research, referring to the patent system that insulates brand-name drugs from competition. More than 70 percent of what Americans spend on drugs is for brand-name medicines protected by patents, though they account for only 10 percent of prescriptions. While epinephrine itself isn’t patented, Mylan’s design for the EpiPen is protected until 2025. A prevailing assumption about the American prescription drug market is that even if medicines are expensive initially, competition from generics will eventually drive prices down. But prices have risen sharply even for drugs with multiple suppliers. The United States is the only developed country that doesn’t cap or negotiate the price of prescription medicines, which means drugmakers can charge whatever they like. And instead of trying to undercut one another, competing suppliers often raise prices in tandem. That’s what the three main suppliers of insulin have done. They’ve also extended their patents by making small changes to the product, though it isn’t clear that they’ve made it safer or more effective. In Europe, where governments can negotiate directly with drug manufacturers, insulin costs a sixth as much. Similarly, the industry argues that patent monopolies incentivize innovation. But there are other ways to encourage and pay for research. CEPR’s Baker points to two: a prize system that would reward pharmaceutical breakthroughs while putting them in the public domain (something Bernie Sanders has proposed); or more up-front public financing for research, via grants that are conditional on the results remaining in the public domain. Some of the blame for the lack of competition for EpiPen and other expensive drugs has been hoisted on the Food and Drug Administration, which rejected EpiPen alternatives from Teva Pharmaceuticals and Adamis Pharmaceuticals earlier this year. The agency has a backlog of more than 4,000 generic drug applications. “There’s a narrative about a sluggish agency that doesn’t really apply,” said Gregg Gonsalves, the co-director of the Global Health Justice Initiative at Yale University (and a contributor to The Nation). The FDA approved a record number of generics in 2015 and in the first seven months of 2016. Overall, the United States approves drugs faster than any other developed country. Yet the drug industry continues to push the notion that the FDA is stifling innovation—a convenient argument, as the industry is also lobbying to gut the agency’s regulatory powers. Last year the House of Representatives passed a bill that would seriously weaken the agency’s ability to ensure that new drugs are safe and effective. Faster drug approvals might boost profits for drugmakers, but they could be deadly for patients: Remember thalidomide? “We’re being told we have to pay millions and millions for products which we’re being told less and less about,” Gonsalves said. One way to increase competition without lowering regulatory standards would be to import cheaper drugs from countries with comparable safety standards. That idea is among Hillary Clinton’s proposals for lowering drug prices. Despite the many hearings Congress has held about price gouging, not a single one of the 15 drug-pricing bills introduced in this Congress has made it out of committee, according to The New York Times. Perhaps that has something to do with the $240 million Big Pharma spent on lobbying last year, more than any other industry. (As James Suroweicki points out, high drug prices are what make this lobbying possible.) It’s possible that public rage about EpiPen pricing could pressure lawmakers to finally act, but if not, there are other options. The Obama administration (or the next president) has two tools that could potentially be used to bust patent monopolies. The first, known as the Bayh-Dole Act, mandates that any drug developed with some public financing be publicly available on “reasonable terms.” If it isn’t, the government can “march in” and license the drug to other suppliers. The trail of financing and the meaning of “reasonable” can be murky, but it’s at least plausible to apply the law to EpiPens: The device’s precursor, the ComboPen, was developed with funding from the Department of Defense. (Michael Hiltzik of the Los Angeles Times explores Bayh-Dole in more detail here.) Another little-known law (28 USC section 149) allows the government to produce patented medicines, regardless of whether they were developed with taxpayer dollars, as long as it provides “reasonable and entire compensation” to the patent holder.